Just in time for Halloween, here is a delicious recipe for everyone’s favorite Halloween treat, popcorn balls! As many of you know, I am a Good Cook blogger, and as one of their bloggers I am often sent great products to try and share with my readers. Sometimes, we are also challenged to create recipes using the items, and this time was one of those times. To kick off a fun month of Halloween Good Cook activities, we were challenged to make popcorn balls from one of two categories: unique recipe or creative idea. 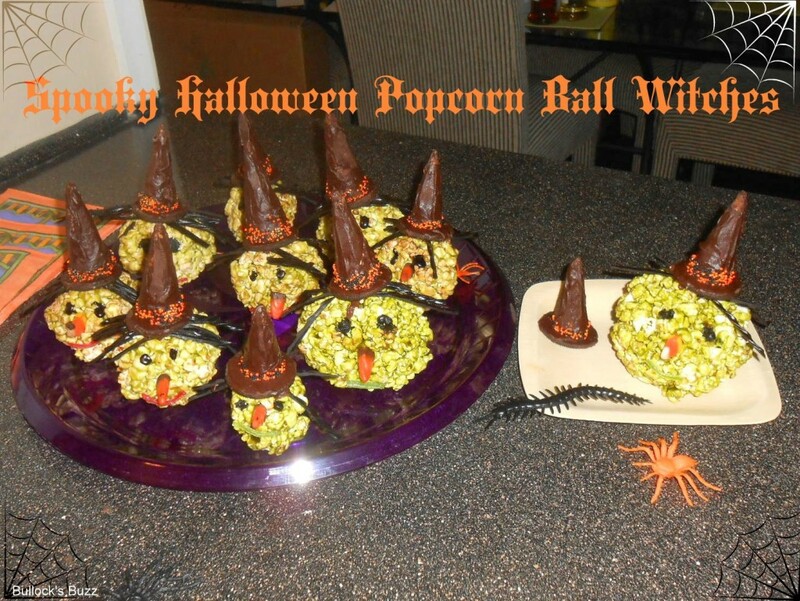 I chose to make a creative popcorn ball out of my recipe and this is what I made…Spooky Halloween Popcorn Ball Witches! 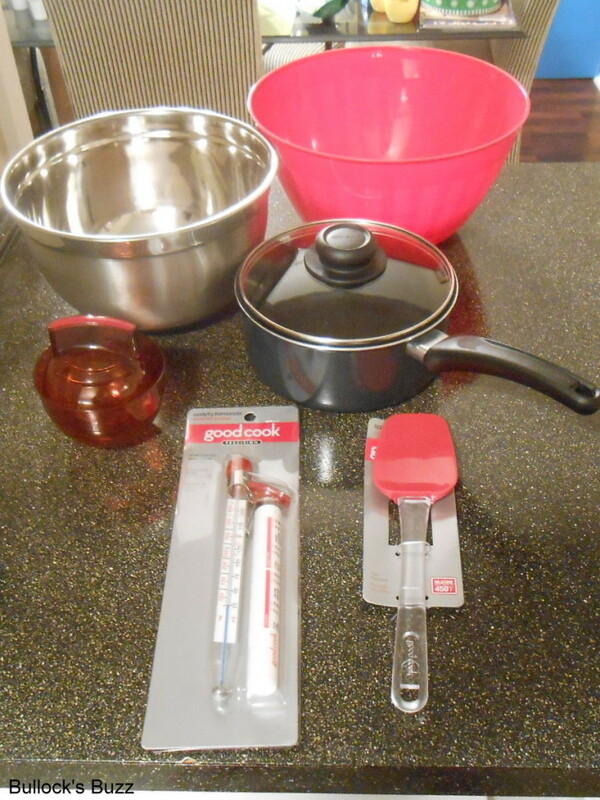 Thankfully I was sent everything I needed to make the popcorn balls including a large plastic mixing bowl, a metal cooking bowl with a weighted bottom, a saucepan, a spatula, a candy thermometer, and the most handy item, the Good Cook Popcorn Baller (round). This is an awesome gadget as it lets you shape the popcorn balls without burning your hands! The Ballers come in a variety of fun shapes including a football shape and square, allowing you plenty of room to create fun popcorn balls. And just for you, Good Cook is offering an additional 25% off your purchase of a Good Cook Popcorn Baller with the code POPCORN at checkout. As this was my first time ever to make popcorn balls, it took me two tries to get it right! The first time I did not let the candy mixture get hot enough so the balls wouldn’t stay together. After another trip to the store, I finally got it right! 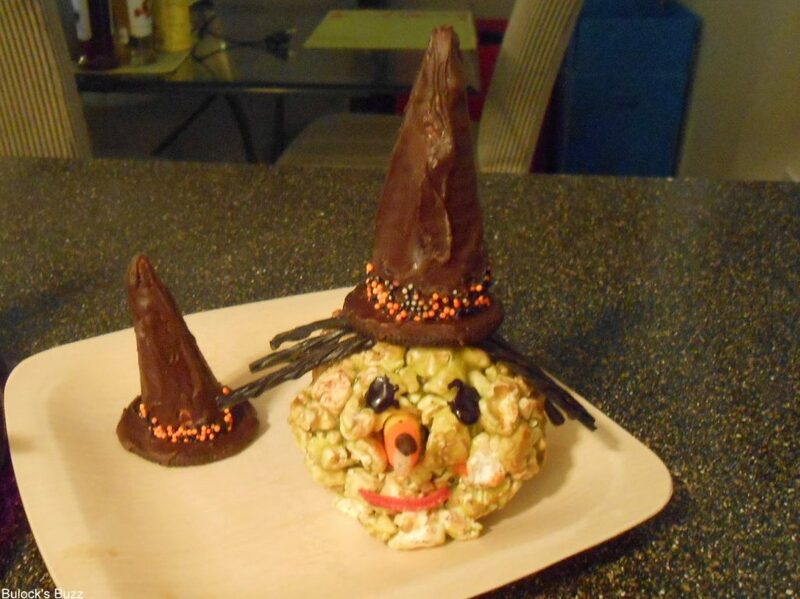 And now, here is the recipe so you can make your own Spooky Halloween Popcorn Ball Witches. Candy corn for nose, black licorice string for hair. I had to cut licorice sticks into long thin slices. Spread out a sheet of wax paper on the counter with the cookie wafers spaced evenly apart. Place chocolate chips in a small, microwave-safe bowl. Cover and heat for 10 seconds. Stir chocolate to aid melting. Repeat as needed until chocolate is melted and smooth. Cut sugar cones down to about 2 1/2 to 3″ tall leaving the pointy side. 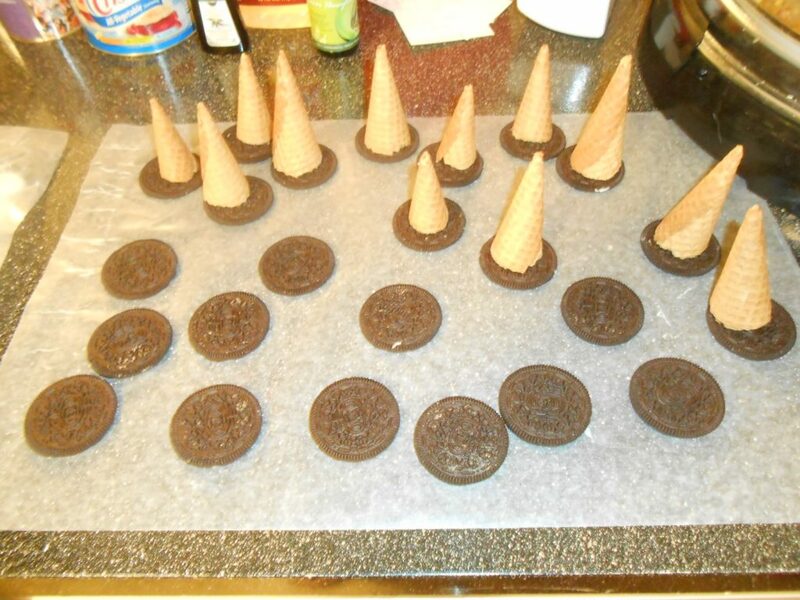 Dip the cones completely in the melted chocolate. Then roll the widest ends only into the sprinkles. Scoop a little bit of chocolate onto the top of the cookie. 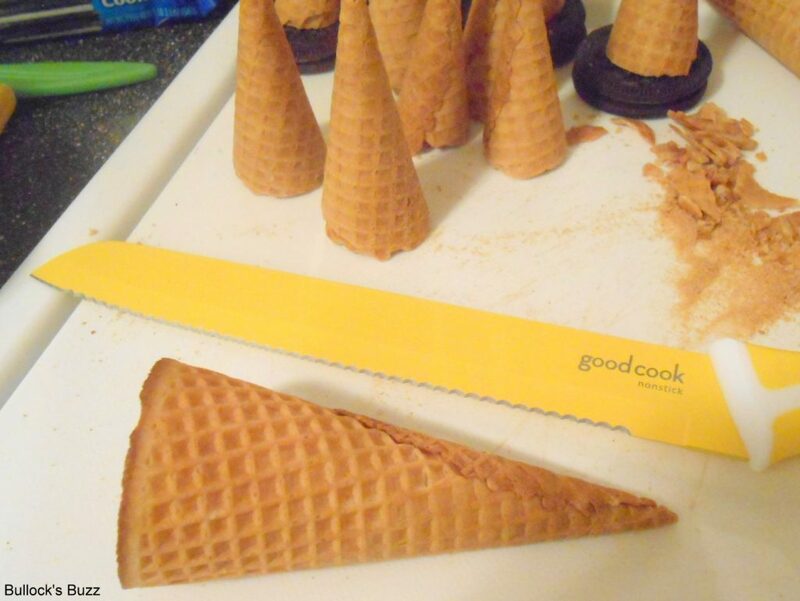 Place the cone onto the cookie wafer to form the rim of the hat. Place into refrigerator to set. Now you need to make the syrup for the balls. Go ahead and have all of your decoration ingredients set up and ready to use because you have to be quick! The popcorn balls will be very sticky at first, but once the syrup on the balls starts to cool, they get less sticky! Pop the popcorn and place in a large bowl to the side. I discovered the metal bowl with the weighted bottom worked better for mixing the syrup. Mix all ingredients (except the vanilla) in a saucepan over medium-high heat. 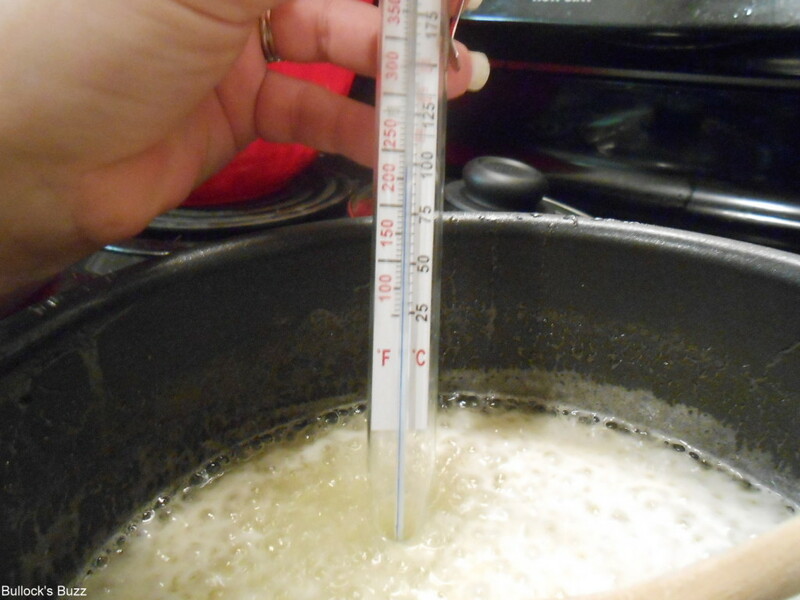 Cook to 250° on candy thermometer, constantly stirring. Now stir in the 1 tsp vanilla. 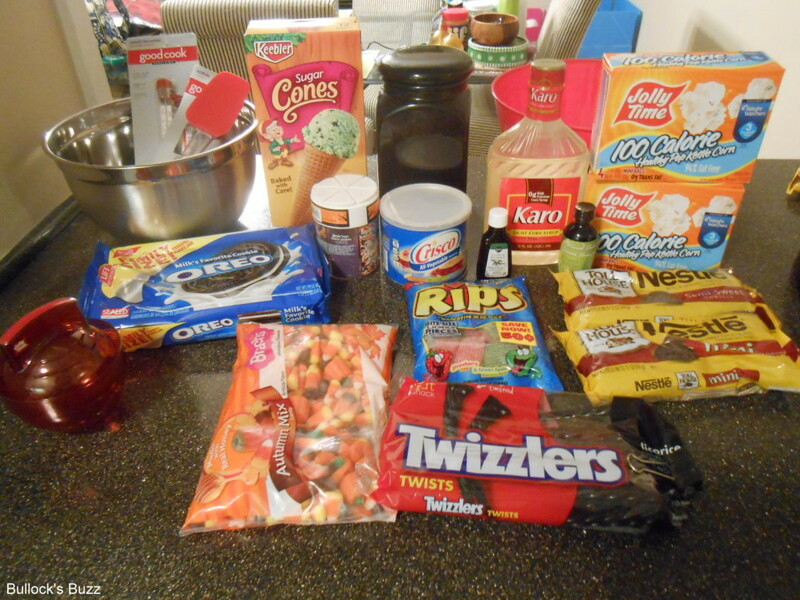 Then add the food coloring until desired color is reached. 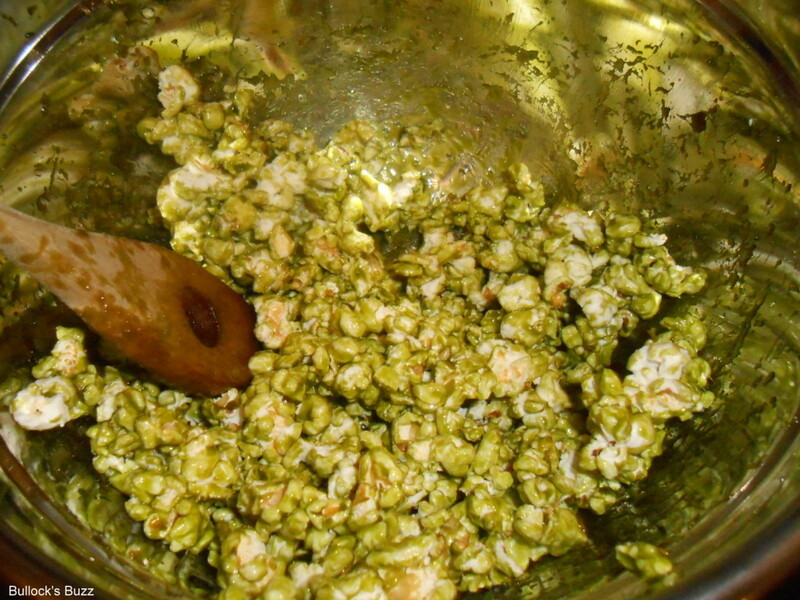 Pour a thin stream over the popped popcorn, stirring constantly to mix well. Use the Popcorn Baller to shape into balls. Spread another sheet of wax paper onto the counter top. Melt more chocolate if needed by placing chocolate chips in a small microwave-safe bowl. Cover and heat for 10 seconds. Stir chocolate to aid melting. Repeat as needed until chocolate is melted and smooth. 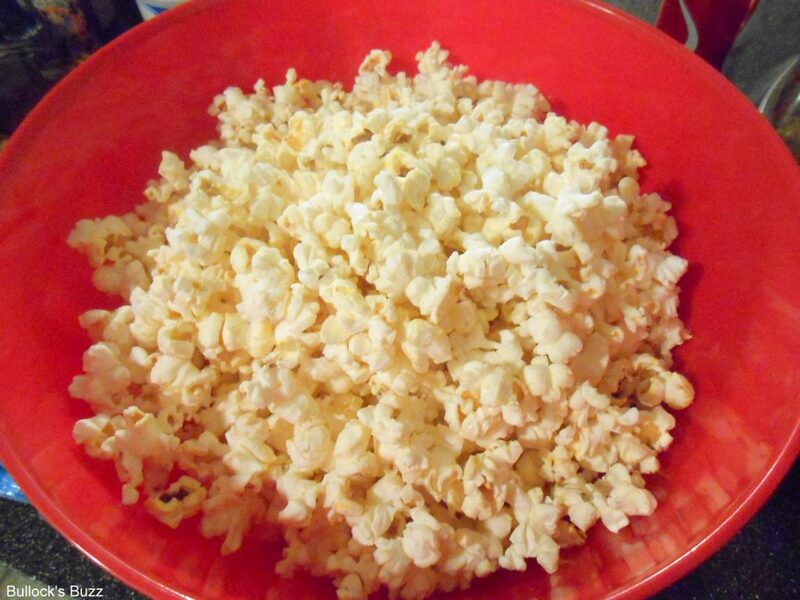 TIP: Cover you hands with a bit of butter at this point to handle the popcorn balls, otherwise everything will stick to your hands! Doing one popcorn ball at a time, spoon about 1/2 teaspoon melted chocolate onto the top of each popcorn ball. Press a few licorice strings into chocolate to form ‘hair’. 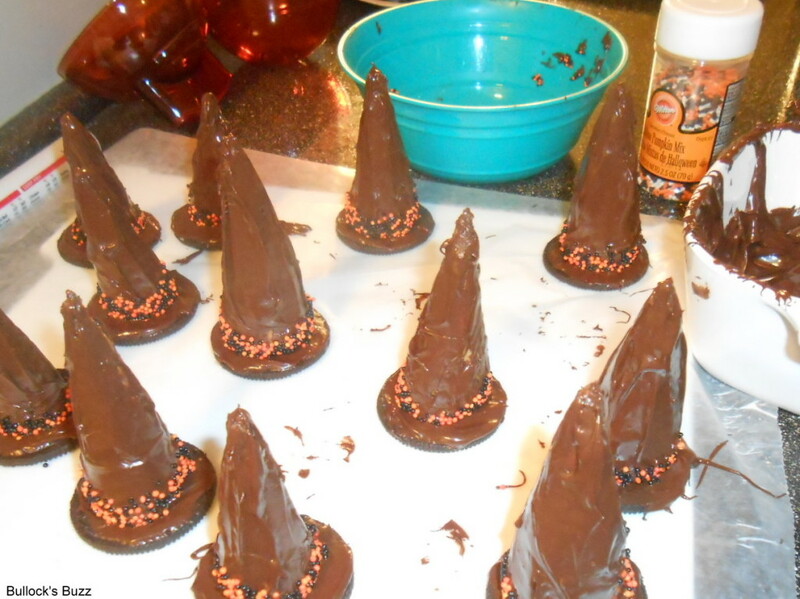 Place the witch hat on top of the hair, adding more chocolate on the underside of the hat if needed to hold it in place. Add candy for the mouth and nose, use the icing to add the eyes. Allow to sit a few for the chocolate to solidify and hold the hair and hats on. To get one of these handy Popcorn Ballers, be sure to go to Good Cook’s website and purchase one. Don’t forget to use promo code POPCORN to save 25%! Also, be sure to check out Good Cook’s Facebook 7-day Popcorn Giveaway which starts on Oct 7, 2013! 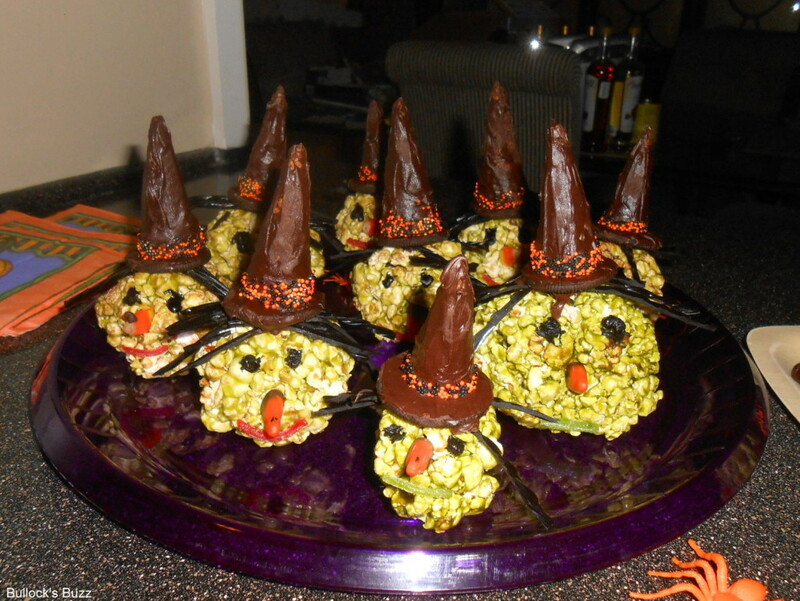 Delightful and Tasty Halloween Popcorn Ball Witches. This recipe is done in several different stages, but the end result is well worth it! Candy corn for nose black licorice string for hair. I had to cut licorice sticks into long thin slices. Make the hats first. Be sure to have all of the decoration ingredients out and ready to go once you finish making the syrup for the balls. Cut sugar cones down to about 2 1/2 to 3" tall leaving the pointy side. Now you need to make the syrup for the balls. Remember, go ahead and have all of your decoration ingredients set up and ready to use because you have to be quick! The popcorn balls will be very sticky at first, but once the syrup on the balls starts cooling, it gets less sticky! Cook to 250 on candy thermometer, constantly stirring. Now add the 1 tsp vanilla, stirring to mix well. Add the food coloring until desired color is reached. Doing one popcorn ball at a time, spoon about 1/2 teaspoon melted chocolate onto the top of each popcorn ball. Press a few licorice strings into chocolate to form 'hair'.